At Full Moon, the Moon is exactly opposite the Sun. Tuesday’s Full Moon appeared in Capricorn, and in the opposing sign, Cancer, the Sun was in conjunction with 20000 Varuna, a large classical Kuiper belt object, which was discovered in 2000. Varuna is highly likely a dwarf planet. At the time of its discovery, it was the largest cubewano found so far. The orbital period is around 283 years. Varuna is named after one of the oldest of the Vedic deities, the maker and upholder of heaven and earth. As such he was king of gods and men and the universe, and he had unlimited knowledge. Originally Varuna was the chief god of the Vedic pantheon, but he was replaced by Indra, and became the god of the seas and the celestial ocean. In art Varuna has been depicted as a lunar deity, as a yellow man wearing golden armor and riding the sea creature Makara. In Hindu astrology, Makara is equivalent to the sign of Capricorn. 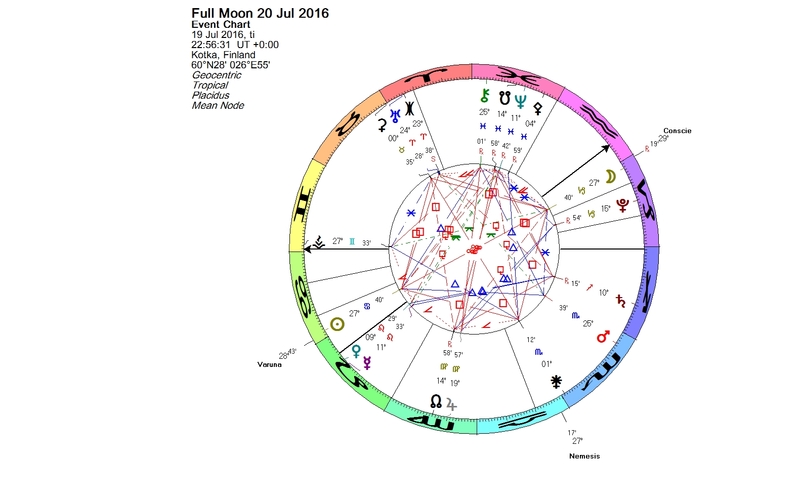 Varuna’s presence in the Full Moon chart deepens the general themes of the Capricorn Moon. Varuna was also the god of law, portrayed as omniscient, catching liars with his lasso. He deals with matters of truth, lies and keeping agreements. Varuna has been described as a vast energy behind everything, too large to comprehend. April 25, 1953 – Francis Crick and James Watson published their description of the double helix structure of DNA in the scientific journal Nature. May 6, 1960 – President of the United States Dwight D. Eisenhower signs the Civil Rights Act of 1960 into law. May 12, 1964 — Twelve young men in New York City publicly burn their draft cards to protest the Vietnam War; the first such act of war resistance. May 26, 1972 — Richard Nixon and Leonid Brezhnev sign the SALT I treaty in Moscow, as well as the Anti-Ballistic Missile Treaty and other agreements. — The Watergate first break-in, the “Ameritas dinner”, fails. June 5, 1981 — The first recognized cases of AIDS. June 17, 1991 — The South African Parliament repeals the Population Registration Act, which had required racial classification of all South Africans at birth. July 1, 2002 — The International Criminal Court is established. July 7, 2005 — A series of coordinated terrorist bombings strike London’s public transport system during the morning rush hour. July 20, 2015 — Cuba and the United States reestablish full diplomatic relations. Two main belt asteroids are standing out in the Capricorn Full Moon chart, and echoing some of the themes of Varuna. Asteroid 12524 Conscience is in conjunction with the Moon. This asteroid is named after Hendrik Conscience, a Belgian writer, and the astrological meaning of asteroid Conscience has not been studied, but sometimes the names work astrologically very well, although chosen quite arbitrarily. We can assume that asteroid Conscience deals with one’s sense of right and wrong. In exact square to the luminaries is 128 Nemesis, a large and dark asteroid, named after the goddess of retribution. According to Demetra George, who has studied a lot about the female shadow, Nemesis in the birth chart symbolizes our conscience and guides us toward taking right action. When we ignore her promptings, we suffer the consequences. The earlier nature of Nemesis was more as an abstract force of justice rather than that of retaliation. Nemesis ensured that humanity respected the natural laws that maintained the order of the universe. The Full Moon chart subtly advices us to listen the voice of our conscience and follow its guidance, and not to be judgmental toward one another. You are currently browsing the Lunations by Kirsti Melto weblog archives for July, 2016.